Our CNPS chapter has sponsored field trips over the years to many interesting locations in and around the San Gabriel Mountains. Here is information about a small selection of them The goal is to provide reference information that may be useful to those planning to visit these places. The gallery pages provide additional supplementary information for some of these places. Santa Fe Dam is always the best wildflower display in L.A. County in the early part of the year. We visited it is March 2009 and again in March 2013. On both occasions it was spectacular, even though in 2013 the amount of winter rain was less than half of the average in recent decades. Our visit to Santa Fe Dam in 2013 was at short notice, prompted by a resport from Walt Fidler, who was there on March 14. His partial list of what was in bloom includes ground pink (Linanthus dianthiflorus), sun cup (Camissoniopsis bistorta), and Solanum xantii. Also occasional blooms of Dichelostemma capitatum, Mirabilis californica, Clematis, Rhus ovata, Eriodictyon trichocalyx, Marah macrocarpus, Phacelia distans, Lathyrus vestitus, Salvia mellifera, Deerweed (previously Lotus scoparius), and Ribes aureum (mostly going to fruit). 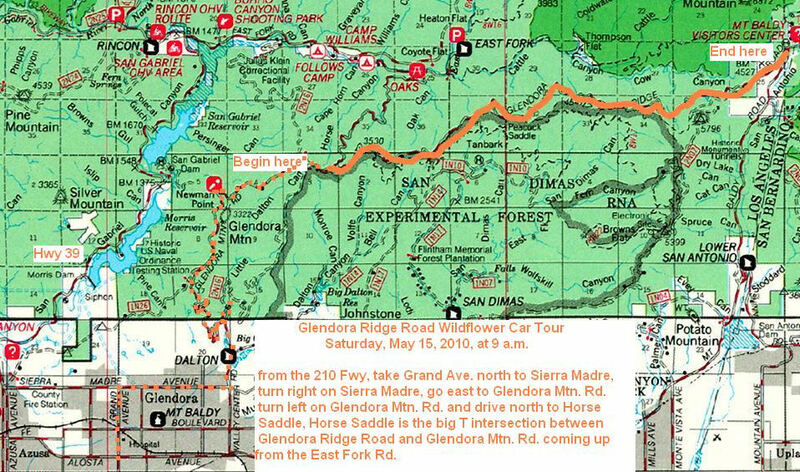 Description: Glendora Ridge Road is one of the best and one of the least known nearby wildflower hot spots, typically best between mid April and mid June. Jane Strong says that on her first trip there in late May several years ago, there were at least 100 species in bloom. You may see elk clover, a yellow Calochortus and a Sedum, all unusual plants locally. Coulter pine is planted along the road and there is a native population east of Cow Canyon Saddle as well. See the gallery page. (1) Checklist of Vascular Flora of Glendora Ridge Road (PDF 463KB) by Bob Muns (optimized for half-sized paper). This list is a result of Bob having walked the entire length of Glendora Ridge Road. (2) May 2010 Supplement to the Checklist (PDF 92KB) by Jane Strong. Map: Click the following links for a map including directions: JPG (240 KB) or PDF (191 KB). Further information: On a trip taken in early April 9, 2010, we saw many wildflowers growing in the Morris Fire burn area along Glendora Mountain Road ... especially nice were the orange fire poppies ... other flowers seen were collarless poppy, coastal lotus, Bishop's lotus, yellow-throated phacelia, large-flowered phacelia, wild Canterbury bells, several popcornflowers, stinky gilia, eucrypta, Nevin's brickellbush, wild cucumber, wild sweet pea, fiddleneck. See the gallery pageabout Glendora Mountain Road. Reference: Click here for Michael Charters's web page. Description: Here you can explore the upper reaches of the Rio Hondo watershed searching for the native flowers, shrubs and trees that grow in the moist canyons, for example, the grape, the sycamore and the bigleaf maple. Flora list: Click for Flora of Monrovia Canyon Wilderness Park by Bob Muns. Description: In early June, this walk typically coincides with best bloom of the native mountain dogwood, Cornus nuttallii. You can take the interpretive trail at a leisurely pace. It is an easy walk that takes a self-guided tour with 24 points of interest about native plants and wildlife. You will find such plants as sugar, knobcone, and Coulter pines, black oak, quaking aspen, white fir, and a whole array of wildflowers. There are three foot bridges that extend over a seasonal creek, and a natural seep (watering hole) where wildlife can be viewed, especially birds, year round. Toward the end of the trail are dogwood groves that are spectacular in the spring. There are numerous benches along the trail for rest stops if needed, or just a place to stop and relax while enjoying the sounds of the forest. Maps with directions: This place is in the San Bernardino Mountains. Click for information from the arboretum web site, or the U.S. Forest Service. Description: This pleasant reserve is located in the Puente Hills off Fullerton Road in La Habra Heights. The trails go through coastal sage scrub and excellent walnut and oak woodlands.